Wow that's a lot later then I expected. Hmmm, now do I still go through and buy my PS4 when I originally planned to (sometime in March) or do I wait till right before Destiny comes out? I'll definitely have to think that through (though I most likely will buy it earlier, only because I want Watchdogs). Its an interesting date to pick... I guess they want to avoid the spring frenzy of releases, but get in before the November Call of Doody. Here is the newest trailer for Destiny! It starts out with rehashes from other trailers, but there is a lot of new content past that. Thats basically a year from now. It better not have any issues considering the late release date. I'm really looking forward to this game, but they need to make sure they get the bugs out. Defiance was so buggy I have no interest in buying another game from Trion.. period. I've never owned a Bungie game and my initial experience with them will be this game. I hope they don't drop the ball. I'd rather they keep delaying it until it has solid functionality and gameplay. Of all the Halo games I've ever played, none of them had game breaking bugs at launch. However, this is their first time going multi-platform. I think a summer beta test is a good move so long it's June or July, and not August. A good 8-10 week test would do some good. I think the multi-platform option all these developers chose was stupid. BF4 should have been a next-gen release only game. Instead they're splitting their support teams into fixing a broken game on 5 platforms instead of 3.. and its a noticeable issue for DICE/EA right now. Watchdogs is probably delayed because of current gen system errors. If not for ps3 and xbox 360, they could have focused on getting the game done and released by now. Obviously COD Ghosts had no problems with supporting 5 platforms.. especially considering that game was all based off old tech. It wouldn't surprise me if the next COD after Ghosts was still released on PS3 and Xbox 360 as well as next gen. But some of these developers are shooting themselves in the foot. They have all this new tech at their disposal and they have to make 2 versions of the game and turn down effects, graphics, change controller layouts, etc. all to release the game on even more outdated systems than initially thought, because of all the delays. Destiny coming out for PS3 and Xbox 360 almost a year after the next gen systems came out seems pointless to me unless the games are cross platform like DC Universe, with the old gen systems still playing in the same servers, but with restricted graphics. It depends on the size of public events. I assume there are going to be some epic bosses and the devil walker just scratches the surface. The older gen can't handle more than 32 still. 10 million during its lifetime? Thats a lot of damn players, even divided by 4... I would say it would be more heavy on the PS4/XB1 side eventually. If it's as good as they're promising and as good as it's been looking in gameplay videos I don't doubt it'll see that many sales. Look at WoW, at one time it had over 10 million subscribers plus who knows how many people outside of that actually bought the core game and all it's expansions (more then 10 million and it's been out for 10 years this Nov). The only thing, as I said, is if they can deliver what they promised. That will be the main deciding factor on whether it can move that many units (I know I'll be one of those 10 millions sales). If anyone can do it it's bungie. Although I was never a huge fan of Halo, I do respect the fact that each game was unique and different from the previous unlike the cookie cutter approach that most fps seires rely on. They aren't afraid to delve into the unknown and take chances. I can't wait to see what they have put together. This game has so much hype.. 10 million life time sales.. I hope the beta is jaw dropping amazing. Because if it is, I think they will achieve that goal. I depends on the testing period. The first few days are going to be a wreck... there are going to be so many people trying it out, but as I've said, this is the best possible thing that can happen. 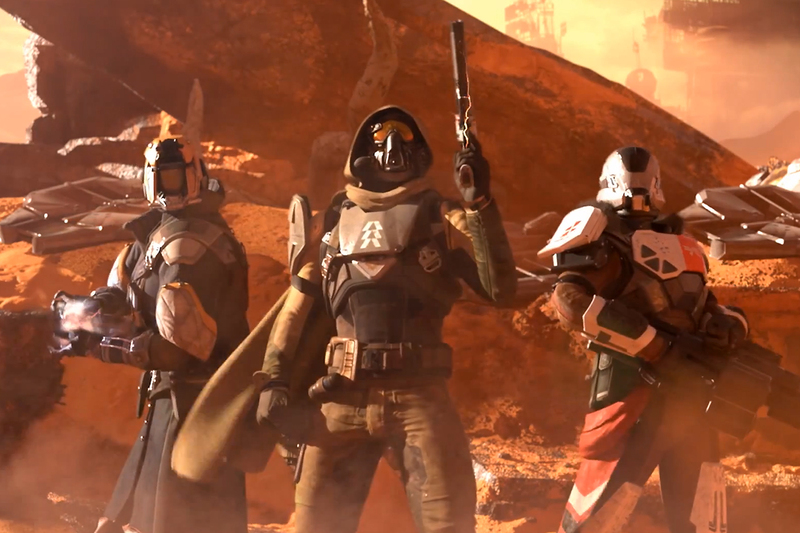 Destiny is going to get a true stress test, unlike every AAA multiplayer experience out there. Open beta use to be common, and one day everyone got stuck up and hired "professional testers"... why pay for something you can get for free? I'm not looking for something thats going to blow my mind, I kinda want that to wait for the actual game, but I would like an epic small taste of what is yet to come. I'm sure there will be plenty of fire team public events. I'm looking at 3 level cap increases, a minor boss, and some pvp testing. Professional testers will test exactly what the company wants them to test, hence why they use them. Plus they use an extremely rigid template as to what can be considered a bug, something your everyday average joe has no idea about. Open betas are the way to go but sadly companies want a true test, not just 1 million+ people to send them random reports about what they think is a bug (to be considered a bug in a professional setting the tester must be able to provide proof the bug exists and proof that said bug can be replicated, something not all open testers are willing to do). This is the reason there is a game tester job in most companies, they want a professional tester who's done this more then a few times to test and find these bugs. Open betas these days are used more as server stress tests then anything else hence why you only see open testing in the last 1-2 months before the game is released. The things you learn when you go to school for this. I'm with DX. I'm not really looking for a mind blowing experience. What I'm looking for is just to see if they are going to be giving us some of the stuff they promised on launch or not (like the public events) and I want to get my hands on each of the classes so I can learn how each plays and what one I like the most. Outside of that I'm already sold on everything else. Redeem to your hearts' content.... 17 codes for something... hopefully custom armors! I claimed all of them! Thanks! Destiny will be playable for attendees at this year's E3 convention. Here is 7 minutes of action packed gameplay showing off various guardian abilities. I like how they didn't put it in cinematic mode and left the HUD and health/shield meters in. Oh yea, I'm definitely stoked for this after that video. It needs to be September right now. Gah, I just wish they'd announce beta dates already. After watching this a few times, you know what I noticed that I really like? Its so simple, yet I haven't seen it done before. The mini map points out where you are being attacked from. I like that sooo much better than the edge of the screen method. I utilize the mini map in any game I play that features it. I much rather refer there than 4 different corners of the screen. I tend to have tunnel vision when I'm focused on an objective and I'm never able to tell where I'm getting hit from otherwise. I'm excited for this game. I'll pre-order it soon. Dressed to Kill - Bungie discusses weapons and armor in the latest video blog on Destiny. I'm glad the loot will be separate. I really like how they are incorporating MMO style elements into an FPS. Elite armor, individual loot, co-op, but then it lets you have your weapons available across all classes and that is great. Depending on how I end up playing this game, I might switch back and forth between sniping and being a tank that rushes into the mass of enemies. Yeah thats a big plus for me because I'm digging that red revolver I keep seeing in the videos. I'd definitely rock a pistol and a shotgun.... I'm interested in seeing a shotgun, they mentioned it, but I don't recall seeing any so far.